Vega Vitamins ZM3 Multivitamins & Minerals Formula is a high potency supplement containing high levels of all essential vitamins and minerals. It contains bio-available forms of all nutrients that are absorbed well by the body. Plus a wide range of antioxidants to help protect against cell damage. Encapsulated in a vegetable cellulose capsule with vegetable magnesium stearate (lubricant). Ascorbic Acid, Vegetarian Capsule Shell (hypromellose), Magnesium Oxide, D-Alpha Tocopheryl Acetate, Anti-caking Agents (Silicon Dioxide, Magnesium Stearate), Nicotinamide, Zinc Citrate, Ferrous Fumerate, Thaimine Hydrochloride, Magnesium Citrate, Pyridoxine Hydrochloride, Calcium Pantothenate, Riboflavin, N-Acetyl Cysteine, Corn Starch, Citrus Bioflavonoids Complex, Inositol, Choline Bitartrate, Modified Tapioca Starch, Olive Oil, Copper Gluconate, Manganese Ascorbate, Acacia Gum, Soya Oil, Cellulose, Coenzyme Q10, Beta Carotene, Sucrose, Alpha Lipoic Acid, Grape Seed Extract (Vitus vinifera), Lycopene, hypromellose, Potassium Iodide, Sodium Molybdate, Lutein Esters, Folic Acid, Retinyl Acetate, Biotin, Antioxidants (Natural Mixed Tocopherols, DL-Alpha Tocopherol, Ascorbyl Palmitate), Sunflower Oil, Chromium Chloride, Corn Oil, Sodium Selenite, Cyanocobalamin, Ergocalciferol. As a food supplement for adults, take one capsule daily with food or as directed by a healthcare professional. Do not exceed recommended intake. Long-term in take of 24mg of Vitamin B6 may lead to mild tingling and numbness. 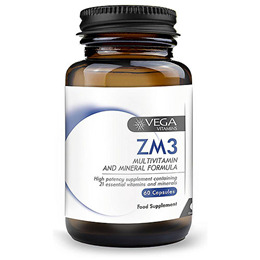 Below are reviews of Vega Vitamins ZM3 Vitamins & Minerals - 60 Capsules by bodykind customers. If you have tried this product we'd love to hear what you think so please leave a review.